Journeyman wines could be added to the Alexander Valley list. Pete Seghesio bottles his Pinot and Chard under the Journeyman label and his Zins under the San Lorenzo label. You can taste both at the bar inside Journeyman meats at 404 Center St. in Healdsburg (the same building that houses Single Thread restaurant). The winery is at Pete's house which is north of Healdsburg in the Alexander Valley AVA. Pete's property, which spans both the RRV and AV AVAs, includes the (old vine) San Lorenzo vineyard which was not part of the sale when Seghesio winery was sold several years ago. Seghesio winery made a single vineyard zin bottling, called the "San Lorenzo" from the vineyard. Pete now calls that (San Lorenzo labeled) bottling of his "The Pearl". He also bottles a second zin (also under the San Lorenzo label) called "Rock Garden" which is a younger vineyard, created from San Lorenzo vineyard budwood. Both are very good, as are the pinot and the chard. You can get a flight of their salumi + wines and eat at the bar or a table (if you're lucky). It's usually busy and is a very small place - you might have to wait. You can also get a pizza or a sandwich and wine by the glass. Monday tastings by appointment only"
I had planned a trip for this week This looks devastating my heart goes out to everyone affected. I've rescheduled my trip for this February. Anyone have recommendations for Sonoma cab? Looking to schedule at least a couple of days primarily focused on chardonnay and pinot noir, and will need a change of pace (also looking at syrah). For a reference point, I enjoy the Stonestreet cabs for the price point ($40-$100) and tasted the 2012 Three Sticks Moon Mountain which was fantastic. If you like Stonestreet check out Calluna as well. Chalk Hill estate Bordeaux style wines, they are a bit lighter than those of Stonestreet but similar aromatics and a pretty good value as well. Lodging and airfare booked for the last week in June. I'm becoming quite familiar with this thread; I should have it memorized by wheels-up time. NYC-area wine geek here. I've always been partial to old-world/terroir driven and natural/biodynamic wines (mostly Italian/French) and I have started to (re)discover some of the great wines from California. From the list in the first post I have tried and enjoyed wines from the following: ...Wellington (though I understand the winery has changed hands). I emailed the new Wellington team and was told that the winery was no longer bottling its "Noir du Noir" Alicante Bouschet-teinturier blend. The old-vine field blend on the estate will now be used for the Zinfandel wines, bottled based on the vine age. The new wines may very well be awesome stuff. I don't know. I really enjoyed the Alicante Bouschet-blend. "We are going through some construction on our tasting room, property, and web site, but worry not, we are still sourcing our wines from the same vines on the same beautiful 24-acre property. My personal favorite wine is our Estate Zinfandel made from vines that were planted in 1924. We have also just released a new wine called Vin de Campagne (wine of the countryside), which does include a number of grapes from the 1924 block, in particular the Alicante Bouschet. "We are doing an extremely low-production, high-end style of French grape varietals by pinpointing various areas of the vineyard to pick from and only utilizing the best of the best grapes. What this allows us to do is produce just 2,000-3,000 cases of extremely high quality wines. We have also begun producing every wine since 2014 in brand new French oak barrels. We will not distribute any bottles to stores or restaurants." I must point out that the new iteration of Wellington Cellars will have Cabernet Sauvignon, Chardonnay, Viognier, a White Rhône-style blend, Grenache, Pinot Noir, Merlot, Malbec, Meritage, & a late-harvest Chardonnay in addition to the three Zinfandel wines listed below. I have not received any notes about the "Vin de Campagne" field blend that Mr Foley mentioned in his response to my email. a dried cherry or plum sauce. This wine is truly a historic Sonoma wine. The 1912 has a unique earthiness with just a touch of jam followed by subtle spice on the finish. Like the others, it is medium in body with balanced tannins and is the perfect zinfandel for enjoying with or without food. Paired with a cool fall evening or a hamburger off the grill, the 1912 will leave you wanting more! balanced tannin, this is a BBQ lover’s favorite summer time red. Paired with the smokiness of ribs, pulled pork, and sausage, this zin will not disappoint. Scott Brunson wrote: Lodging and airfare booked for the last week in June. So we are staying in Windsor the last week in June. What is the best coastal drive? It can include a fun lunch restaurant or simply a fun picnic spot. A winery visit would be fine, but not a requirement what are the Fort Ross wines like? Is the visit worth the drive? Scott Brunson wrote: So we are staying in Windsor the last week in June. Grab yourself a loaf of Sourdough and take River Rd out to the coast Hwy 1. Head South where the road splits just before Jenner. There is a guy in a turnout about 1/3 mile in that sells really good smoked salmon. Check out Goat Rock and see the Sea Lions at the mouth of the Russian River, Arched Rock Beach, maybe stop in Bodega Bay and do some shopping or sightseeing at Bodega Head. From Arched Rock Beach turn onto Coleman Valley Road and follow it all the way to Occidental. Taste with Kurt at Bohème before heading back into civilization. Brian - we just opened our new tasting room at the Sonoma Square on 1/6. Please add us to the Sonoma Valley listing. We are open noon to 6 daily and we are pouring multiple cabernet sauvignons, malbec, merlot, sauvignon blanc and cuvee wines. Thanks! Let me know if you see mistakes or omissions. Last edited by Brian Tuite on January 10th, 2018, 7:05 am, edited 2 times in total. Adding AVA maps to the individual AVA headings. Not having a lot of luck finding good high-res single AVA maps. If anyone has some links they could share I’d be appreciative. Perhaps just link to the online everyvine maps? ClydeUnderwood wrote: Perhaps just link to the online everyvine maps? Yeah, I looked at those. 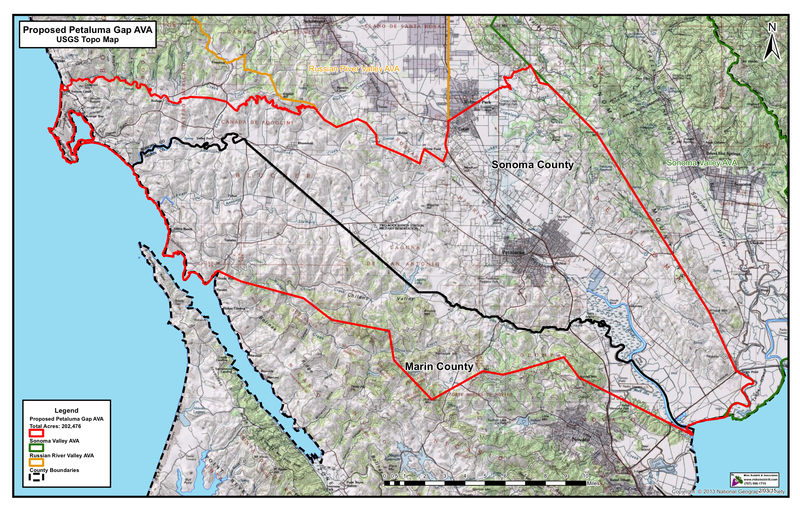 Ideally I would prefer maps like this one of Petaluma Gap. A real topographical map, concise boundaries, sharp image, But I might not have that option. Surprised USGS doesn’t have similar AVA maps available. Brian, stopped by Gary Farrell some time in December. They have gone to reservation only and no reservations open on a Friday morning. Inspiration Tasting: $75 per person and 90 minutes. Exploration Tasting: $55.00 per person for 90 minutes...etc. It has been a few years since I had last stopped by and was disappointed. The view is great and the tasting room beautiful. They say that they are moving toward a more educational experience. I also stopped by Hop Kilm since I had heard it was acquired by Landmark and thought that it might result in an improvement. They are working on the the building's foundation. Beautiful setting as always. They also poured some of the Landmark wines. Interestingly, they also expressed that they may be going to change and would probably go to wine-tasting educational experiences. Scott, if you'd like a coastal drive, don't miss Coleman Valley Road between Occidental and Hwy 1. Perhaps loop in a visit to Freestone Artisan Cheese and Wildflour Bakery in Freestone. Many great restaurants: River's End, Rocker Oysterfellers, Nick's Cove, Hazel, to name a few. Please lmk if you'd like a tasting and/or vyd tour -- best luck to you. Heading to Sonoma for a week long trip on February 5. Any special events going on, live music maybe? I' going to be visiting The Girl and the Fig, Auteur, Hanzell, Sojourn, and Willi's Seafood Bar on day 1. Littorai, Willow Wood Market Cafe, Iron Horse, Martin Ray, Fogline on day 2 with dinner at Bravas. Gary Farrell, Williams Selyem, Arista and Valette for dinner on day 3. Porter Creek, Hartford, Martinelli and Lynmar with Farmhouse Inn to cap off the trip. I hope I don't gain 15 lbs!!! Bryan Price wrote: Heading to Sonoma for a week long trip on February 5. Any special events going on, live music maybe? I' going to be visiting The Girl and the Fig, Auteur, Hanzell, Sojourn, and Willi's Seafood Bar on day 1. Littorai, Willow Wood Market Cafe, Iron Horse, Martin Ray, Fogline on day 2 with dinner at Bravas. Gary Farrell, Williams Selyem, Arista and Valette for dinner on day 3. Porter Creek, Hartford, Martinelli and Lynmar with Farmhouse Inn to cap off the trip. I hope I don't gain 15 lbs!!! I have used information from this thread and found it quite helpful. Thank you, Brian. Took a 1/2 day jaunt to Sonoma during a recent trip to San Francisco. Visit to Sojourn tasting cottage off the Sonoma square was fantastic. Chase, our host, was great. Small mix up on the appointment day, but quickly and graciously resolved. Particularly a fan of the Gawalla and Sangiacomo vineyard pinots. Highly recommended. These folks are a pleasure to deal with and I will return. Lunch at El Molino Central. Our second visit there. Again, what a great recommendation. Although the menu is small and the surroundings modest and casual, the quality of the food is astounding. My only regret is that I did not get a chance to try everything. Wow. Finished the run with a visit to Donum. The person who greeted us (Maggie?) was charming and the grounds/art/buildings where incredible and definitely worth a visit. The wines were a bit of a let down after Sojourn. Our host really ought to do something else for a living. Don't think I have ever been served by more disinterested person in a wine context. I think he was focused on his modeling career. First of all, thanks for this thread. It’s an incredible resource. Quick question: My wife and I are planning a Sonoma trip in May, staying at the Renaissance Lodge. I’ve long wanted to check out Smith-Madrone on Spring Mountain. Is getting up there feasible? And, are there other places you’d recommend on the way? If you plan on going there from the hotel you have two options. Hwy 12 through Sonoma Valley to Calistoga Rd to St Helena Rd/Spring Mtn Rd or Hwy 121 to Hwy 29 through Napa, Yountville, Oakville, Rutherford St Helena to Madrone/Spring Mtn Rd. The possibilities are endless. Best to do an early tasting at Smith Madrone and then choose a route back South either through Sonoma or Napa. The route would determine the suggestions for other stops. You could probably fit in lunch and one more tasting. Last edited by Brian Tuite on March 2nd, 2018, 8:42 pm, edited 1 time in total. I was leaning toward coming back into Sonoma and maybe trying to grab an appointment with Fisher on the way down spring mountain. Semi related: good place in downtown sonoma to grab a great picnic lunch to lug up there? Jeremy, please post notes (and pics) when you are back home from the trip! Drew Goin wrote: Jeremy, please post notes (and pics) when you are back home from the trip! Thanks, Drew. I'll be sure to do that. With an early start is this too much to try and accomplish in one day? With a hike in Armstrong? Last edited by Leonard Taylor on March 13th, 2018, 6:34 am, edited 2 times in total. Leonard Taylor wrote: With an early start is this too much to try and accomplish in one day? With a hike in Armstrong? It’s totally doable as long as you don’t spend too long at any one place. Roll into Armstrong Woods @8am. —————> Wildflour Bakery in Freestone is only open Fri-Mon and closes at 6pm. Make sure you get to Freestone by then. Not much else going on there, don’t blink. Don't leave home without it - your Visa Signature card. Mike Kuller wrote: Don't leave home without it - your Visa Signature card. I have that covered in the OP. Thanks though. Thanks. Guess I missed it. Very thorough . Any thoughts on the itinerary below? We've just got a weekend (May 4-6) so trying to make the most of it via a quality-over-quantity (and minimal-driving-time) approach. Flying in from Chicago midday Friday and staying at the Gaige House. I feel pretty good about everything here based on the incredible intel in this thread, but would love additional suggestions or guidance. Have booked every appointment listed below except Arrowood. Could also use a good quick lunch suggestion for the gap between Auteur and Sojourn on Saturday. Last edited by JeremyMullman on April 2nd, 2018, 10:59 am, edited 1 time in total. We've just got a weekend (May 4-6) so trying to make the most of it via a quality-over-quantity (and minimal-driving-time) approach. Flying in from Chicago midday Friday and staying at the Lodge at Sonoma. We are looking forward to your visit with us on Friday. That’s not a lot of time to eat lunch on saturday - may want to check out the Sunflower Cafe (on the Sonoma Plaza). if you're not averse to sausage, Hare & Hatter on the Square is perfect for a quick bite. Thx, Karen. Looking forward to it as well! 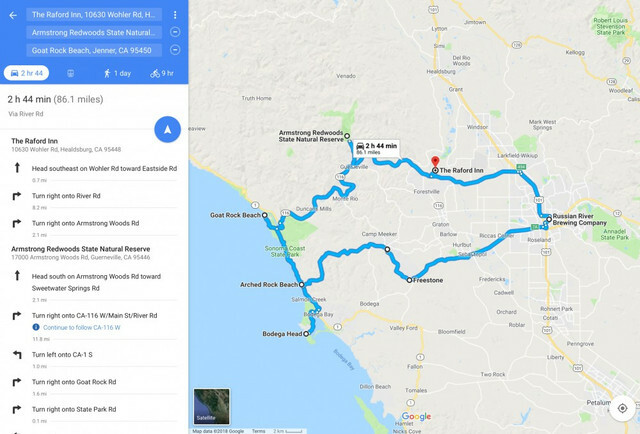 My entire family (me, wife and 3 kids, ages 10, 7 and 3) is headed to Sonoma on Memorial Day and will have that afternoon/evening (5/28), Tuesday (5/29) and Wednesday (5/30) to explore. It’s been almost 10 years since my wife and I last visited. I’m looking for recommendations and thoughts on wineries, eats and activities that may be kid-friendly. We will bring books, coloring books, and tablets to watch movies if wi-fi is available at wineries. Two kids are pretty picky eaters, but we can usually find something for them. Also, being from the DFW area (very spread-out), driving 20 miles at a time is nothing for our family. No rest/nap time needed for the kids. **Is there anything to see/do on the way up or that evening? This thread is overflowing with great thoughts and advice. Still looking for lunch recs (both days) and possibly one RRV/Dry Creek winery. I'm VERY late to this thread, but I just spent a few days in Sonoma. And at every step, I lived by this thread, which was completely invaluable. Thanks so much, Brian. It was a pleasure meeting you. Would love to meet up again soon to open up some wine. What’s a good scenic, coastal route from San Francisco to Sonoma? Route 1 to tomales/Petaluma road? Tom G l a s g o w wrote: What’s a good scenic, coastal route from San Francisco to Sonoma? Route 1 to tomales/Petaluma road? Yup, but take 1 North to Bodega hwy then go East through Sebastopol/Santa Rosa and take 12 right into Sonoma. Day 1—We drove up Silverado trail, stopping to visit Napa Valley Wine & Cigar and EMH Black Cat. After lunch at Cindy’s (can’t believe she is closing), we Drove across the mtns to our place in Windsor (Worldmark Resort—nice place on Windsor Golf Course with a decent kitchen and a gas grill on the patio). Provisions at Oliver’s Market—like a medium Whole Foods but much better. Day 2—Windsor Certified Farmers Market. Then we hit some balls, and did a tasting at Limerick Lane, followed by dinner at Hana. I liked the Limerick wines; Hana was fantastic. Day 3—We ate lunch at El Molino Central (I’ll dream about the chicken mole tamales), then did a tasting at Hanzell (THANKS JASON), a tasting at Jean Edwards (THANKS KAREN), and a tasting at Enkidu (THANKS PAUL). Each one different; each one delightful. Day 3—We drove back to Napa for tasting at Lewelling/Hayfork. I really need to buy more Hayfork; I’ve been on the Lewelling list for a long time. We ate lunch at Gott’s, then drove back to Windsor to play golf. Windsor Golf is a fun course. Day 4—We made one more trip across the mtns to visit MACDONALD and Continuum. We had an amazing visit with Alex (the ’15 is dynamite). It was our first time at Continuum since they finished all of the construction. I’ve been on the list since the first vintage. Lunch was La Luna taqueria. Day 5—We played golf at Northwood (OMG beautiful), then did the member tasting at Copain and tried Acorn. The Acorn wines are pretty good, but tasting 15 wines at Copain was a highlight. Day 6—We did Brian Tuite’s recommended coastal drive, slurped some oysters in Bodega Bay, drove the sidewalk which is Coleman Valley Road, and ended in Occidental at Bohème (THANKS KURT). He drove us to taste in Stuller Vineyard. I think these wines deserve a lot more Berserker love. They are terrific expressions of each site. Ending the week with dinner at Brian’s place put a nice exclamation point on the Sonoma/Napa part of our trip. Then a few days in San Francisco—Farmers Market Mexican for lunch/dinner at Gary Danko/Dim Sum at Hang Ah (touristy I know but was still tasty)/Thirsty Bear Brewery/R&G Lounge/Great Eastern/Tadich Grill Martini lunch. The full geeky details with tasting notes and photos are on the CellarTracker forum. we Drove across the mtns to our place in Windsor (Worldmark Resort—nice place on Windsor Golf Course with a decent kitchen and a gas grill on the patio). Our good friends invited us to stay there four years ago. Great location! The golf course is fun, and Charlie's restaurant on the golf course is really nice. Within walking distanace of the Resort, good food, golf course views and they allow you to bring your own bottles. Might I add that Scott’s avatar photo does not do him justice, he’s lost some weight. Thanks for adding your experience, we had a blast Friday. I meant to visit this thread earlier; our visit is almost upon us. drive to the Fairmont Mission Inn in Sonoma where we'll be staying. Our concierge recommended Umbria in Glen Ellen for dinner. Sonoma Plaza tasting at Bedrock. We'd like restaurant recommendations for a Healdsburg light lunch. Any "must see/must do" activities in Healdsburg? We're looking for Monday afternoon activities, walks around interesting towns, etc., before our flight out of Sacramento mid evening. Warren, looks like a fun time. If you are out in Bodega why not go to Terrapin Creek in Bodega Bay. Michelin star 6 years in a row but casual atmosphere and service. If you decide to go back to your hotel area, skip Umbria and go to Glen Ellen Star. Fabulous restaurant, be sure to order the veggies (any of them) they are all awesome. PM me if you need any more info, we have hit just about every place in the county . ...go to Glen Ellen Star. Took your advice tonight, and glad we did. Thanks!!! Spent the morning fixing/updating the OP. Image links were all broken due to the website upgrades so they all should now work. Removed some closed businesses and updated a few others. I know I haven’t found everything so if during your perusal if you notice a winery/restaurant/hotel etc which is missing/listed incorrectly/listed when no longer in business, please bring it to my attention and I will do my best to get everything updated in a timely fashion. There’s a lot of content there which is now over 4 years old. There are bound to be changes/additions needed and mistakes fixed. Our Sonoma trip with photos (with a quick stop in Napa). anyone able to help Chris out on this thread in the travel forum? One of my favorite memories was winning their annual spelling bee - never even used the gift certificate!